The number of people fined for failing to pick up their dog's poo fell by almost 20% last year, according to figures obtained by BBC Radio 5 live. In 2014-15, 2,868 fixed penalty notices were issued in England and Wales - down from 3,521 in the previous 12 months. According to the figures there were 73,824 complaints about dog mess in 2014-15 - but 103 councils did not issue any fixed penalties. The government said it was working with councils to find "local solutions". Fixed penalty notices can be issued by people, including council officers, to anyone who fails to clean up dog mess on certain land where the public have access. The cost of the penalty varies in different local authorities but it is usually about £75. 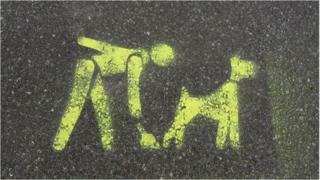 The BBC asked the 348 local authorities in England and Wales which deal with dog fouling about fixed penalty notices. The figures come from the 302 authorities which responded. Of those, 103 did not issue any fixed penalty notices in 2014-15, and 48 had not issued any in the last five years. These included Bexley, Swindon, Bournemouth, East Hertfordshire and Merton councils, which between them received almost 8,000 public complaints about fouling from 2010-15. Barnsley Metropolitan Borough Council issued the most fixed penalties last year - 187 - and Liverpool City Council issued the most over five years - 972. Sheffield City Council, which did not issue any fixed penalties for dog fouling in 2014-15 and only handed out seven in the previous four years, said: "We do appreciate that dog mess is an issue in Sheffield, as it is in every city. "However, we need evidence if we are going to issue fines. "In these times of austerity we simply do not have staff available to patrol Sheffield's parks around the clock, waiting for an offence to be committed. "If a person is alleged to have allowed their dog to foul and not cleaned up, we will contact that person and give advice." The council said it was running a "social experiment" on how to reduce dog fouling, and successful schemes were being implemented across the city. In Daventry, Northamptonshire, the council is consulting residents on a new system under which any dog walker found without a bag to collect waste could be fined £100. The Department for Communities and Local Government said environmental crime, including dog fouling, "blights communities and poses a risk to human health". "That's why in the last government we organised the huge Community Clear Up Day across the country, and why this government will continue to work with councils and partner organisations to help find local solutions to littering," it said. Refusal to pay a fixed penalty notice for dog fouling in England and Wales can lead to an appearance at a magistrates' court and a fine of up to £1,000. The BBC Radio 5 live figures only cover England and Wales, but similar rules on dog fouling exist in Scotland and Northern Ireland. Video Dog fouling fines: Why are some councils stricter?